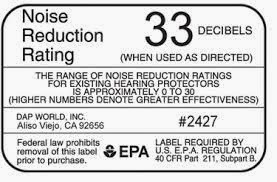 For all hearing protection devices from ear plugs to ear muffs, there is a NRR (Noise Reduction Rating) score that informs consumers how much of a decrease in noise exposure to expect with use. For example, if an ear plug has a NRR score of 30, use of the device would be expected to reduce a 90 decibel sound by 30 decibels resulting in a noise exposure of 60 decibels. If two hearing protection devices are used, an ear plug inside the ear canal followed by ear muffs over the ear, the ultimate noise exposure would be an additional 5 to 10 decibels greater than the higher rated NRR of the two devices. Given that, there are MANY different types of hearing protection devices on the market. Regardless of style, most devices offer a NRR between 20-30. However, as a general rule, ear plugs typically offer a higher NRR than ear muffs. Among high NRR earplugs, disposables offer higher NRR than reusables. BUT... ear muffs typically block sound more consistently than ear plugs which require some degree of molding and fit for optimal effectiveness. Using both obviously is better than using just one. Also, keep in mind that unless hearing protection devices are correctly fit and used properly, the attenuation suggested by NRR may not over-estimated. Indeed, lay-use of such devices without training typically result in sound attenuation far below what NRR may suggest.